1Q. Hydrogen rich alkaline water is an antioxidant and prevents brain damage? Ans. Molecular hydrogen (H2) can protect cells and tissues from oxidative damage by selectively reducing reactive oxygen species (ROS) It also reduces oxidative stress and prevents cognitive impairment associated with dementia and Parkinson’s disease. 2Q. Hydrogen Rich Alkaline Water May Improve Mood Disorders? Ans. Because of the hydrogen present in the H-Rich water which increases the adult neurogenesis, this may be used for improving depression and some mental disorders. 3Q. Hydrogen Rich Alkaline Water Suppresses Inflammation? Ans. In a study, patients with rheumatoid arthritis, a chronic inflammatory disease, drank 1.5 L/day of hydrogen water for 4 weeks. By the end of the study, all patients with early rheumatoid arthritis achieved remission and 20% became symptom-free. 4Q. Hydrogen Rich Alkaline Water Reduces Muscle Fatigue, Motor Deficits, and Muscle Degeneration? Ans. In an experiment with young athletes, drinking hydrogen water reduced lactic acid build-up during heavy exercise and decreased muscle fatigue. It was also found that hydrogen water can potentially improve muscular dystrophy in DMD patients. 5Q. Hydrogen Rich Alkaline Water Prevents Metabolic Syndrome? Ans. Hydrogen water can significantly reduce the fatty liver with type 2 diabetes and obesity as well as with a high–fat-diet-induced fatty liver. 6Q. Hydrogen Rich Alkaline Water May Help in Weight Loss? Ans. Long-term drinking of hydrogen water may help in controlling the body fat and weight, despite no change in food and water intake. 7Q. Hydrogen Rich Alkaline Water Enhances Mitochondrial Function? Ans. Hydrogen water can directly protect the mitochondria and improve the outcome of mitochondrial disorders and also stimulate the energy metabolism (as measured by oxygen consumption and CO2 production). 8Q. Hydrogen Rich Alkaline Water Enhances Would Healing? Ans. Hydrogen water intake via tube feeding in elderly patients reduced the wound size of pressure ulcers and enhanced recovery. 9Q. Hydrogen Rich Alkaline Water May Prolong Lifespan? Ans. Because of the strong anti-oxidant nature of H-Rich Alkaline water, It may reduce the oxidative stress of the body and may help prolong the life span. 10Q. Why Should I drink Ionized water? Ans. First and foremost, it is a powerful antioxidant. People spend hundreds of dollars a month purchasing antioxidants because they help to neutralize damaging free radicals. Since Ionized Water is a liquid antioxidant, it is absorbed easily which makes it much more effective and very inexpensive. Secondly, Ionized Water is very alkaline. Most of our diets consist of foods that are extremely acidic, which over time, can prove to be unhealthy. Consuming large amounts of soft drinks, fast food & processed foods can contribute to weight gain and sluggishness. Maintaining an alkaline pH (6.9-7.2) helps us to maintain an ideal environment within our bodies. Third, Ionized Water is very hydrating. Ionized water contains only five to six water molecules per cluster while conventional water contains ten to thirteen water molecules per cluster. The water cluster of ionized water has changed from an irregular shape that has 10-13 molecules to a hexagonal shape that is half the size. This smaller or “reduced” water is, therefore, very absorbable. 11Q. Hydrogen Rich Alkaline Water Treats Diabetes? Ans. A clinical trial in patients with type 2 diabetes and impaired glucose tolerance showed that drinking hydrogen water (900 mL) for 8 weeks decreased cholesterol, normalized glucose tolerance and improved insulin resistance in a majority of the treated patients. 12Q. Hydrogen Rich Alkaline Water May Treat Metabolic Acidosis? Ans. 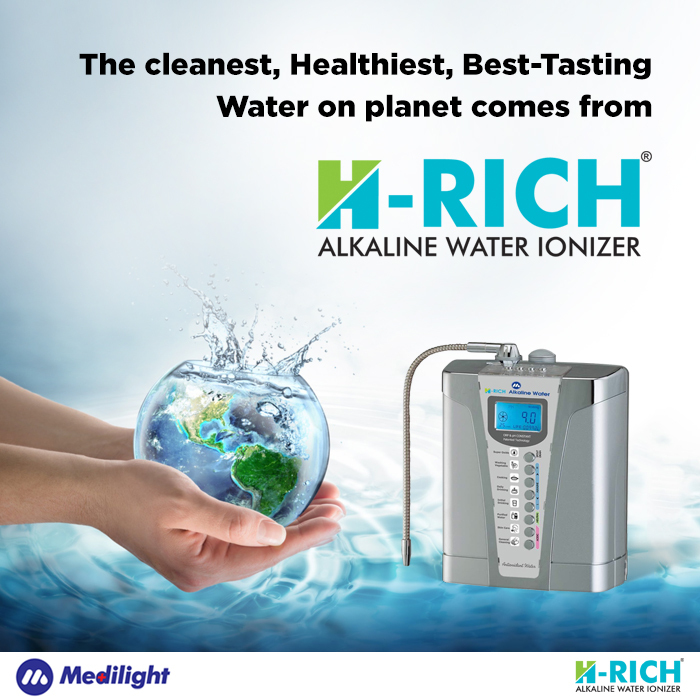 Alkaline Hydrogen Rich Water provides mineral hydroxides and carbonates which may help in preventing metabolic acidosis. 13Q. Hydrogen Rich Alkaline Water May Prevent Cancer? Ans. Hydrogen Water may prevent cancer due to its good detoxification and anti-oxidant properties. 14Q. Hydrogen Rich Alkaline Water Reduces Side Effects of Cancer Treatments? Ans. Drinking hydrogen water can improve mortality and body weight loss caused by an anti-cancer drug, cisplatin, and also reduces kidney toxicity. 15Q. Hydrogen Rich Alkaline Water Boosts Skin Health? Ans. Bathing in hydrogen water for 3 months significantly improved wrinkles in the skin in a human study. It also helps to reduce the human skin cell damage from ultraviolet (UV) rays. 16Q. Hydrogen Rich Alkaline Water Limits the Damage of Transplant Organs? Ans. In one study, the anti-oxidant property of Hydrogen helps in reducing the oxidative stress on the transplanted kidney. 17Q. Hydrogen Rich Alkaline Water Improves Bladder Dysfunctions? Ans. Hydrogen water significantly suppresses the bladder weight increase and oxidative stress. These suggest that hydrogen water could help patients with a bladder obstruction by decreasing oxidative stress. 18Q. Hydrogen Rich Alkaline Water is Cardio-Protective? Ans. Hydrogen water significantly improves the heart muscle function which in turn could be useful for diabetic heart muscle disease. Ans. Treating the cornea with hydrogen solution significantly reduced angiogenesis (blood vessel growth), indicating that hydrogen therapy may prevent blindness caused by chemical burns of the eye. 20Q. Hydrogen Rich Alkaline Water Prevents Hearing Loss? Ans. Molecular hydrogen protects auditory hair cells from oxidative damage which in turns helps to protect against noise-induced hearing loss. 21Q. Hydrogen Rich Alkaline Water Combats Allergy? Ans. Drinking hydrogen water eliminated an immediate-type allergic reaction by suppressing inflammation. 22Q. Hydrogen Rich Alkaline Water Ameliorates Kidney Disease? 23Q. Hydrogen Rich Alkaline Water Protects the Liver? Ans. Drinking hydrogen water suppresses liver fibrogenesis by protecting liver cells from free-radical damage. 24Q. Hydrogen Rich Alkaline Water Promotes Gut Health? Ans. Hydrogen-rich water can alleviate stomach mucosal injury indicating that hydrogen water may protect healthy individuals from gut damage caused by oxidative stress. 25Q. Hydrogen Rich Alkaline Water Protects the Lung? Ans. Hydrogen water consumption creates a protective effect against lung tissue injury by suppressing inflammation and oxidative stress. 26Q. Hydrogen Rich Alkaline Water is Radio protective? Ans. Hydrogen treatment inhibits irradiation-induced death in cultured human white blood cells, suggesting that hydrogen may be used as an effective radioprotective agent. Ans. Intake of hydrogen water can alleviate common symptoms of neuropathic pain thus concluding that hydrogen water may be helpful for relieving nerve pain in a clinical setting. Ans. Heated hydrogen water was found to be an effective anti-tumor agent. It also inhibited angiogenesis (blood vessel growth) in cultured human lung cancer cells. Ans. Hydration is a maintenance of the water content in your body cells. In a simple sense when we do activities like running, jogging, skipping, playing, etc., we feel thirsty, the reason behind it is the loss of water content of our body cells, which leads to activation of the thirst center in your brain and tells you to take water for the proper and better hydration of your cells. When we drink water, it reaches first to your stomach and intestine (Bowel) from there it reaches to blood and each cell of your body. Hydration is responsible for the maintenance of your body cell vitality. We can judge the hydration status of your body by your skin complexion, tongue wetness etc. Ans. Detoxification is the process of removal of all toxins from our body. Daily our body is dumped with a lot of toxins, these toxins are both internal and external. Internal toxins are generated in the process of your body cell metabolism, external toxins are what we get from the exposure to polluted air, intake of polluted water and food. Water flush away the toxins from your body..
30Q. Is your normal tap water or your RO water can do these two functions (Hydration & Detoxification) effectively? Ans. Ionized water will take care of this functions more effectively. 31Q. What is this Ionized water? Ans. 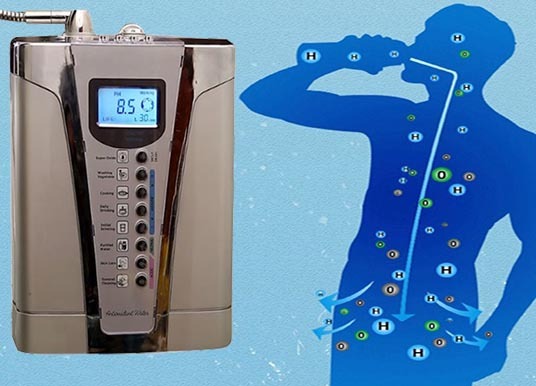 The water ionizer is a device which works on the principle of electrolysis, which we learned it during our high school days in chemistry subject. The electrolysis is nothing but the splitting of your normal tap water into two parts the alkaline ionized water and acid ionized water which comes out through two separate outlets from the machine. This process of Ionization splits the large water molecules into very small hexagonal water molecules which can easily penetrate each body cell 20 times better than the normal tap water and RO water. 32Q. Ionized water okay, What is this Alkaline ionized water? Ans. According to the Ph scale ( potential of hydrogen), the value lies between 1 to 14. The Ph scale tells you whether the substance is acidic or alkaline. Substance with value less than 7 is called acidic, more than 7 is an alkaline substance. 33Q. What is the use of Alkalinity? Ans. Our blood Ph ranges between 7.35 to 7.45, the Ph of the fluid surrounding the developing baby in a pregnant lady is 7.5 to 8, the Ph of sea water is 8.2 where the fishes and plants live in sea. So the Alkalinity with the Ph range between 7 to 9.5 is always good for health, we don’t require high alkalinity ( between 9.5 to 14). 34Q. What happens with alkalinity? Ans. Alkaline environment will stabilize your body metabolism and make it function your system smooth and efficient. 35Q. I am healthy now, why should I think about alkalinity now? Ans. Externally you may look healthy, but internally our body is facing three important stresses from the polluted environment. 36Q. How does a water ionizer produce ionized water? Ans. Water is run over positive and negative electrodes, which ionizes the water. The ionized water is separated into alkaline water and acidic water as it passes through membranes. This is accomplished by repelling the water, now that it has been “charged” with positive and negative ions. 37Q. How does ionized water taste compared to conventional water? Ans. A common remark regarding the taste of Ionized Water is that it tastes smoother than conventional water. This is because of the molecule cluster size and shape. It also does not fill you up and bloat you the way conventional water can do if you drink a lot of it at once. 38Q. Is it safe to take alklaine ionized water? Ans. Alkaline water consists of calcium and magnesium which are important for our body metabolism. 39Q. Does ionized water have any negative effects? Ans. Absolutely none, so long as it is used properly. Only the alkaline water should be consumed. NEVER DRINK THE ACIDIC WATER. We have never seen a single negative effect from Ionized Water, either alkaline water or acidic water when properly consumed/used. 40Q. Who should drink ionized water? Ans. Alkaline ionized water is great for everyone; this includes children, adults, elders and even your animals! It has benefits to some degree to nearly everyone and everything it comes in contact with. 41Q. How should I start drinking ionized water? Ans. Start out drinking a lower level strength at level one, drinking 1-3 glasses per day. If the ionized water agrees with you, increase the amount you drink and the level of Ionization intensity. You can slowly improve taking water up to 9pH. The antioxidant is most powerful at 8.5 and 9 pH. 42Q. Can ionized water be used commercially? 43Q. How does ionized water affect sports professionals? Ans. In an extremely positive way! Numerous athletes have reported increased stamina and endurance from drinking the water because of the abundance of oxygen and a smaller cluster size of the water molecule. When professional and amateur athletes discover Ionized Water, it usually becomes one of the most established benefits to them. 44Q. 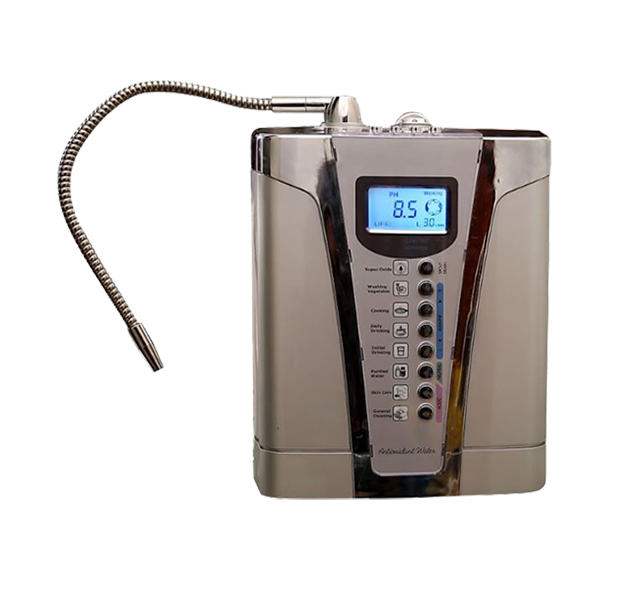 Why should I buy a water ionizer? Ans. The Health Benefits of Ionized Water are numerous (as stated above). It is best to have a machine readily available because fresher the water, the better it is. 45Q. Will I need a plumber to install a water ionizer? Ans. No; this can be done by an average person who has little or no plumbing experience. 46Q. How long will it take to install a water ionizer? Ans. Approximately 5-10 minutes. Refer to the user guide for installation instructions, or check the support page for our installation video. 47Q. Will I need any additional parts to install my new water ionizer? Ans. About 1% of all taps do not have the standard screw thread that will fit the faucet diverter that comes with your Water Ionizer. In the unlikely event the faucet diverter will not fit your sink, note what kind of faucet you have and take the faucet adapter to any hardware store. They will have the necessary parts you will need to complete the installation. 48Q. What kind of warranty does my new water ionizer have? 49Q. How much water should I drink and at what strength when I first get the ionizer? Ans. This will depend partly on what kind of physical shape you are in when you initially start drinking Ionized Water. For instance, if you have made a conscious effort to eat well and keep your body detoxified, you can start drinking Ionized Water at about 8 on the pH scale. You should begin drinking Ionized Water on Level One (between 7-8 pH). Start by drinking an 8 oz. glass of water slowly. If you do not feel any negative effects, try another glass later in the day. In three weeks, you can move up to Level 2. 50Q. Can a person become too alkaline from drinking ionized water? Ans. People have been known to drink as much as 1 to 2 gallons of Ionized Water every day and receive great benefits from it, without becoming too Alkaline. In short, it is very difficult for us to become too Alkaline. We should always drink Alkaline Water. 51Q. Hydrogen Rich Alkaline Water is Antibacterial and May Promote Oral Health? Ans. Hydrogen water may improve oral hygiene because of its antibacterial effect against cavity and gum disease-causing bacteria.